One of the driving forces of human evolution and power, just like Wrath. And just like Wrath, it is much maligned and fought against in our modern world. Everyone from politicians to the Occupy movement love to protest against greed. At least, the greed of others. They say nothing of their own greed. Indeed, they revel in it, as swine in mud revel in the presence of things they cannot understand, but love to think they have mastered. But while they are subject to greed, the pawns of it, they do not understand it. Greed is desire. It is drive. Greed, not only is good, it is power in and of itself. Greed makes us build things, consume things, gather them together into ever greater piles. It drives us towards people, much like Lust. It drives us to overcome, much like Envy. Indeed, Greed, Lust, and Envy often gather together and empower each other, along with Gluttony. Most people think Greed is merely about money and wealth, but that’s not true. It is so, so much more than the mere desire for the green. It is about life itself. Greed drives some of us to the next breath as much as Wrath does, and while my own way was forged in the fires of Rage, I am not without my Avarices, my need for material things. And in obtaining them, I gain more of what is life. Each book, each mini, each friend, feeds my Greed and makes me hunger for more. 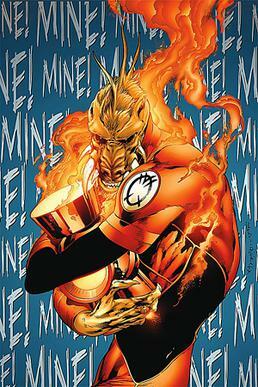 Hmm, I do love the Orange Lantern oath. Of course, there are those who view Greed as bad. Mostly because they find themselves weak, and unable to fulfill their desires (mainly because they do not understand it). So, since they cannot have what they desire, they seek that none should have their desires as well. They fear the power gathered into the hands of a few, are jealous of that power, and like the Power of Wrath, they want it done away with. But we can no more do away with Greed than we can do away with human nature. So embrace your Greed and make it yours. Seize it in your fist, then use it to obtain your desires. To hunger is to embrace humanity. Only through throwing yourself fully into it can you gain complete control, but be warned, the weak will be consumed in the desires of Greed as easily as the fires of Rage.